Representing yourself in traffic court? Tips for success from a pimp. – Disorderly Conduct. Representing yourself in traffic court? Tips for success from a pimp. It seems that these pages get a lot of hits for people looking for tips on representing themselves in traffic court. They have a ticket, don’t want to plead guilty, and surely don’t want to pay a guy like me to help them. Who can blame them? You headed to Kane County Branch court for that speeding ticket? Bad registration at the McHenry County Courthouse? You probably don’t need me… or any lawyer. I’ve hinted at this before, but if your traffic record is good, the ticket you received is for a minor violation, and you are reasonably decent at explaining yourself, hiring an attorney for traffic court might just be one of the biggest wastes of money out there. The law isn’t overly complicated. And, quite frankly, the folks at the Kane County traffic court are generally decent people to deal with. If your record is bad or it’s not a minor violation, on the other hand… I do offer free consultations. Anyhow, I saw something in court today that had me reconsidering the fact that I’ve published that advice on a public web page. I was waiting in line to start a trial in traffic court. Before our case, the judge called the case of a lady who wanted a trial and was representing herself pro se. Prosecutors hate having to deal with pro se trials. I love watching them. It’s fun seeing normal people push back on the system because, honestly, it doesn’t happen enough. Anyhow, in a move you don’t see all the time in traffic court, the Judge asked the lady if she’d like to make an opening statement. He, very nicely, explained to her that she didn’t have to say anything but could use this opportunity to make a statement telling him what she thought the evidence would show and give him an idea of what to look out for. My ears perked up and I started paying better attention. This was her chance to get her version out before the cop even got to speak. This was her chance to start persuading the judge before the prosecutor even called a witness. This was her chance to show the judge that she was just a normal, likeable person taking on a trained government lawyer and paid, professional witness. This was her time to explain to the judge why he was going to see David stand up and fight back against Goliath. You are going to find me guilty because it’s my word against his. What? Serious? Damn! I was almost sorry I started to pay attention. What’s that saying about “you never get a second chance to make a first impression?” Her opening statement told the judge that she’s already not anticipating victory. Guess what happened in that one? Yeah. She lost. Nothing like setting the bar low from the outset. You really don’t give yourself much of a chance when the first thing out of your mouth both tells the judge you’re not expecting to win and tells the judge he’s not going to believe you. Oddly, many judges don’t have the automatic presumption that police are more believable than regular people. Oddly, in traffic court people often get a much better shake than in, say, felony court. 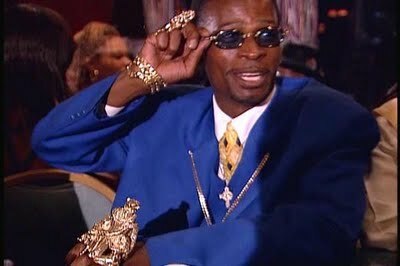 I once saw a television show that documented a Philosopher who went by the name of “Pimp Snooky.” A small sliver of Pimp Snooky’s philosophy was something you should really keep in mind when you’re in front of the judge. It’s very simple- “Let your next move be your best move.” That is what the lady today should have let shape the first words from her mouth. She should have opened with the best thing she had to say. While Pimp Snooky may be a Philosopher, he’s not a prophet. Sadly, the rest of Pimp Snooky’s philosophy seems to be really, really, really bad advice. I can’t advocate following a single other thing the man has said. That little bit, though, is gold. Any time. And by that, I mean ANY time a judge gives you a chance to speak freely about your case you need to put your best foot forward. If you’re representing yourself in traffic court, don’t lead by admitting defeat. Make Philsopher Snooky proud. Let your next move be your best move. I would think this should go without saying. I guess not. Previous Previous post: If they weren’t guilty, the police wouldn’t be searching.